Listen to "'I Heard You Paint Houses': Frank 'The Irishman' Sheeran and Closing the Case on Jimmy Hoffa" on your iOS and Android device. Plans have been announced to turn 'I Heard You Paint Houses' into a major motion picture directed by Martin Scorsese. The working title for the movie is 'The Irishman'. The first words Jimmy Hoffa ever spoke to Frank 'the Irishman' Sheeran were, 'I heard you paint houses.' To paint a house is to kill a man. The paint is the blood that splatters on the walls and floors. 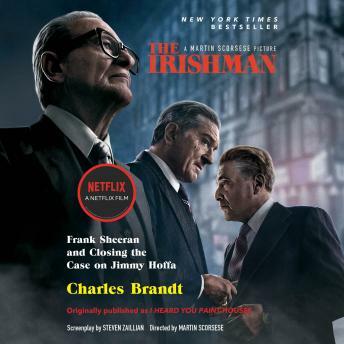 In the course of nearly five years of recorded interviews Frank Sheeran confessed to Charles Brandt that he handled more than twenty-five hits for the mob, and for his friend Hoffa. As a life long Teamster. I found this book very informative. I highly recommend this book. Awesome book, if you ever wondered about the assassination of JFK and the disappearance of Jimmy Hoffa you definitely need to give it a listen. I have researched a lot of books about Mafia members and it was really interesting to hear how they were tied in. Enjoyed this book. It was very interesting. A lot of the book took place in the area where I live so I could picture the landmarks and locations. Scott brick is an excellent narrator and I always enjoy listening to him. The mafia and the Hoff disappearance are two subjects that have always been very interesting to me. So this book was right up my alley. After listening to it I was quite surprised that unlike most first person mafia type books it didn't seem like bragging or trying to convince you there was a good reason to kill. The more I listened the more I enjoyed. The part about Hoff was great and having read several books on the subject his account seems the most plausible. Sadly he didn't bury Mr. Hoffa in the end zone of Giants Stadium as I had hoped. If you enjoy reading about the mafia listen to this book. If you're looking for closure to the Hoffa case.... Well as I said this is the most plausible account I've read but the while Hoffa is mentioned a lot in the book. It was surprising how small the section about his fate was. If you want to learn more about Hoffa and the mafia you'll love this book. Sorry for making my review longer then the book itself, but I hope it was helpful.